Have a question for Vinh Hung Riverside Resort? "The breakfast has a lot of choice and it is very yummy,such as noodles or watermelon juice"
"The staff service is good and professional"
Just a few minutes' walk or complimentary boat ride from the ancient town of Hoi An, the Vinh Hung Riverside Resort is located on a river islet in charming, beautifully landscaped grounds. 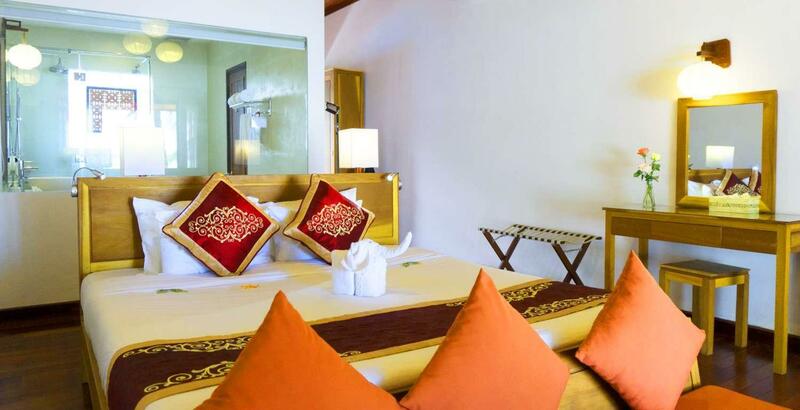 This 4-star hotel blends fine Vietnamese tradition with modern facilities and service. 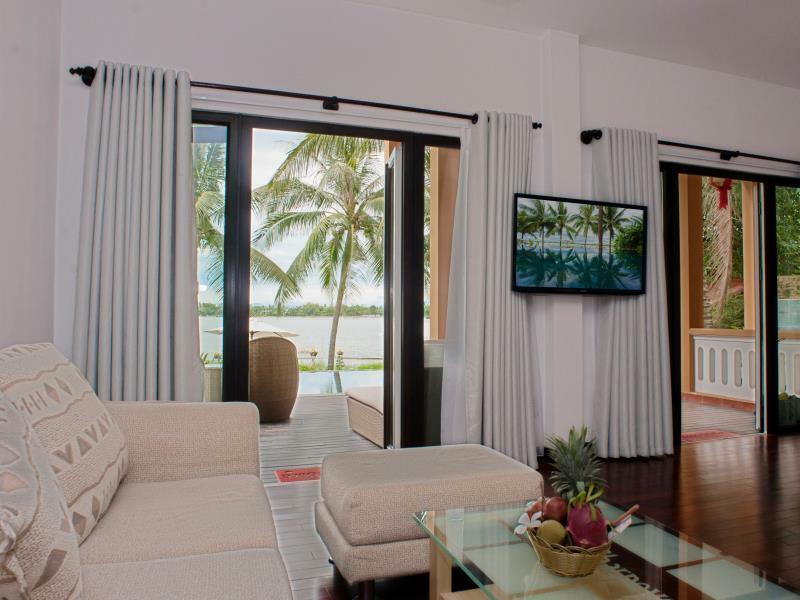 The grounds and most rooms have magnificent views of the romantic Thu Bon River. Facilities include an outdoor pool, sauna, hot tub, fitness center, business center, and restaurant serving Vietnamese, Asian, and international food. To make your reservation at Vinh Hung Riverside Resort, please proceed to our secure online booking form. "This will have been my third stay at the Vinh Hung Riverside..."
The property offers daily local food tasting followed by a sunset cruise on Thu Bon river. For guests staying 6 consecutive nights, a special meal either lunch or dinner will be offered. Vinh Hung Riverside resort was more beautiful than in the photos. Loved seeing the falling flowers onto the pathways, beautiful rooms and lovely resort layout. The food tasting was delicious. The resort was closer to the ancient Hoi An bustling part than I thought and it was only a 5 minute walk to the heart of the town. The breakfast has a lot of choice and it is very yummy,such as noodles or watermelon juice.The staff service is good and professional.We book a service to take around the Hoi-An by ship.It is good service and bring us a good experience.We can see a beautiful view.We have a tea during 4:00.It is very yummy and delicious .The tea buffet is more delicious than what i ate in Hoi-An and DaNang .Although it have not a kind of choice in tea time ,it is very yummy . We loved our 6 night stay in this beautiful oasis. Tam the guest manager was a treat to be greeted by almost every morning. Such knowledge & humor. Fabulous service with a smile so close to ancient town and the night markets. We travelled in Vietnam for almost three weeks. We never had bad or even less polite experience with the staff in all the places we’ve been to. It will always be 5 Star. The hotel quality varied a lot in the price range we booked (30-60 US per night). The stuff was very kind and helpful. The resort for sure has had better times in the past, but renovations are going on. It’s located very central to the old town and offers free transfer by boat. Nice but not necessary. It’s a short walk. Get bicycles rented and explore a little. That makes sense. So if you don’t expect a five star standard for a 50 US room, you we’ll be fine here. Lovely location next to the river and a very relaxing location to return to after sight seeing. Quiet and peaceful with nice pool, garden and gym. 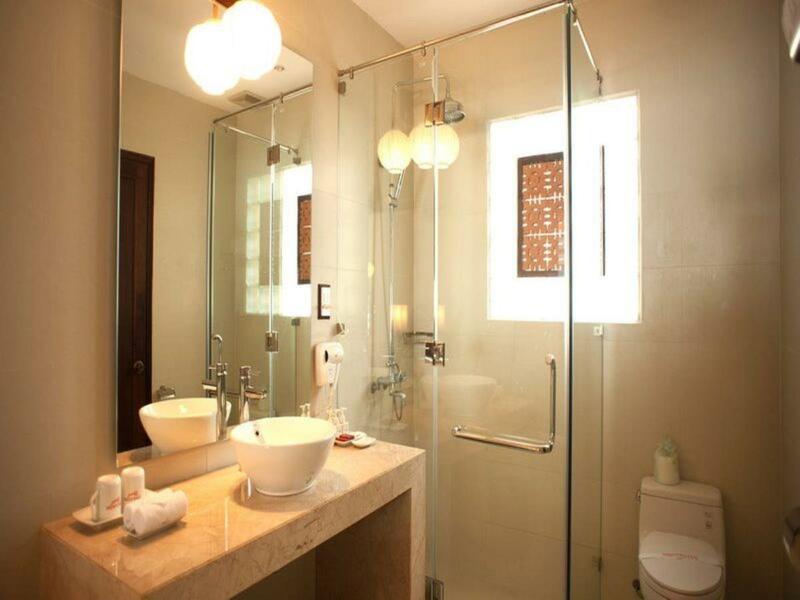 It’s within easy reach of the old town of Hoi An. Plentiful breakfast, free boat to the old town and free snacks in the afternoon to try out local foods. We stayed in one of the garden view rooms. The room was very spacious although it could have done with a wall fixed shower over the bath. Overall the hotel is excellent value for the price. Overall good hotel by the river, but a bit dated. Location is near to night market and about 5-10 min walk to the bridge/city center. If we come back to Hoi An, we may stay in different/newer boutique hotel closer to center. Stayed here for 3 nights and enjoyed the stay. The superior garden room was fine. It was quite dark and the balconies are not private but a couple of chairs outside the room door. Breakfast was fine. The hotel is popular with families the main pool was full of noisy kids most of the time. The smaller pool was nice and quiet though. .
Staff are amazing!!!!! Thank you for a wonderful experience . We stayed in a deluxe river room near the quiet pool area. We had the return transfer airport pickup and it was great. No hassles at the airport. We were greeted by friendly staff and it never ended. Outstanding service from Giang . I hope you go to this resort and meet all the amazing staff. Like others have said free tasting of local foods free sunset cruise and free one way transfer to ancient town. We even had a free meal at the restaurant all the food was delicious and so many choices for breakfast. So close to everything and we booked all our tours through the hotel and price was great too. Please go to this wonderful Hotel its truly worth it . Ideal, quiet, riverside location but just a short walk to the old town. The staff are friendly and funny and we really enjoyed them. Breakfast was top-notch and dinner excellent. We lived the riverfront rooms with good wifi and facilities. We would stay here again. We had the pleasure of spending 4 nights at Vinh Hung Riverside. The location is absolutely perfect - a 1-2 minute stroll to the night market where all the action happens and with a fantastic array of food options. Besides the location, the resort layout is fantastic. Most of the rooms are surrounding the pool, but there is a large area near the outdoor bar where you can sit and relax as well as enjoy the free BBQ food options available from 4-5pm (perfect snacks to go with cocktails). I was overjoyed when we arrived and there was a special message on my bed wishing me a happy birthday and i was also delivered a gorgeous bunch of roses. Breakfast selection was expansive and tasty. We never ate at the restaurant as there were so many options just a short stroll away that are much more affordable. The bar staff were fantastic - although the pool bar was supposed to be open from 12pm-4pm for happy hour but often no-one arrived to man the pool bar until 3pm. Will visit again!! I love the location, the room sizing, the facilities, the little things the hotel offers free of charge etc. My only comments on my last stay is that the reception staff didn't speak to the persons that obviously answer email enquiries, resulting in my having to confirm some 5 times the taxi pick up from and to the airport which marred this part of the experience. I also find it somewhat strange that in a hotel that does seemingly a lot to entice their customers (like the birthday thing they do - not telling you if you haven't had a birthday there yet) but then they cannot remember when someone has been there 5 times in a relatively short time. Surely that is what hotel records are for? Yes I have recommended this hotel to everyone and sundry and will do so further, but those things did irk me this time! This will have been my third stay at the Vinh Hung Riverside in Hoi An. I was as always extremely satisfied with my stay. It is in a great Location for the Old Town. You can hire a bike or get laundry done a few yards away from the main entrance. The staff at the Hotel could not be more helpful or welcoming. It will not be long before my fourth stay! We loved the location on the river to watch the boats. The old town is within walking distance. Quite touristy but fun none the less. In the evening they served free food at the resort from the locals. Free breakfast was generous and tasty. Our room came with a nice semi private pool but because it was cool and rainy we didn't use it. The room was clean but had a musty smell so that's why the 4 stars. It wasn't a problem though. Would book again. We have spent almost a week in Hoi An at Vinh Hung. Great location with easy access to the old city by foot, but they also offer a free boat transfer a few times per day. The staff is very nice and helpfull, good facilities, but we could not use most of them because of the rain. A very good impression overall. Deluxe river view room with patio and two sunbeds overlooking the river is definitely the room to book. Recommend room 711 (twin beds) or 712 (large double bed) as they are furthest from the public ferry jetty next to the hotel. The noise of river boats never disturbed us although we heard them frequently. Complimentary three course Western or Asian meal plus free transport back to the airport for our booking of 7 nights. Plenty of electric sockets taking all sorts of plug throughout the room . Location is perfect being only 5 minute stroll to the old town, and the hourly shuttle boat to the market at the far end of town is an added bonus. The only downside to this hotel is the slow and intermittent wifi. This is a great hotel right on the river. You can walk into town so no hassle getting a taxi, hire bikes across the road, good pool and breakfast is nice. They also have an afternoon street food market for free and a boat river into town. Staff are just great as well. Location is great as you can stroll into Hoi An. Take a free river boat river to the town. A free afternoon food market, notes and gifts in my room every night. Clean and helpful staff with good massage place as well. Could not ask for more.